Reflections, by Bill Tomek | UNL Band Alumni Association, Inc. 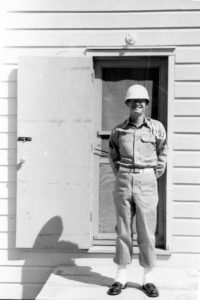 Upon completion of the eight-week school, I and several others were assigned to the 4th Armored Division band in Ft. Hood Texas. In route, we stopped at Ft. Chaffee Arkansas for a few days, and transients like us were used as guards at their stockade (prison). Guards were given a loaded carbine and assigned to a guard tower. I recall thinking that I can’t tell the officer in charge that I was unqualified on the weapon. But, I had hunting experience with a rifle and shotgun. So, I did not say a thing, and since no one tried to escape, it was a non-issue. If the band at Ft. Hood had carbines available, they were not used. Thus, I never fired the weapon that we were allegedly supposed to use. Most band members were college graduates or had some college education; our director—a Chief Warrant Officer—was a graduate of the Juilliard School of Music. The drum major and assistant leader was a graduate of Ohio State University, but was only a corporal. The number of privates, corporals and sergeants in a 42 piece band was fixed by an “organization table.” Promoted to private first class upon graduation from band school, I was made a corporal while a band member. The band was integrated by race, but not gender. Band members lived in suites designed for three persons, with small private bedrooms, shared bathroom, and shared living room. A rehearsal space was nearby and close to division headquarters. (The division commander sometimes attended rehearsals with his staff, I know not why.) The band had a variety of uniforms that required frequent cleaning or laundering, which was provided. We did polish our boots and belt buckles. Meals were provided at a mess hall for independent units like the band and the military police. A typical day started with section rehearsal followed by band rehearsal. Since many jobs involved marching, relatively little additional marching practice was needed. Performances usually occurred afternoons, weekends, or evenings. With the rehearsal time plus performances, I became quite a good trombonist, though I did not have the natural talent to be “great.” Monday was the most common day off. On days with no job, we played volley ball, talked, wrote letters, or perhaps went to the PX or a movie. None of us had a car; so off-post recreation was limited. The band did many types of performances. One was playing for on-post graduation exercises. The monthly cook school graduation was a favorite, as they treated us to cake and coffee, and it was an “easy job.” (We played the national anthem and a little music before the ceremony.) The NCO school graduation was another regular job, where a one-star general gave the same speech every month. This became a subject of humor, as we silently (?) anticipated his words. The band played concerts at various venues, especially on holidays, and we also participated in variety shows on post, sometimes collaborating with professional singers. The band played for many kinds of parades that often included units ranging from battalions to (rarely) the entire division. 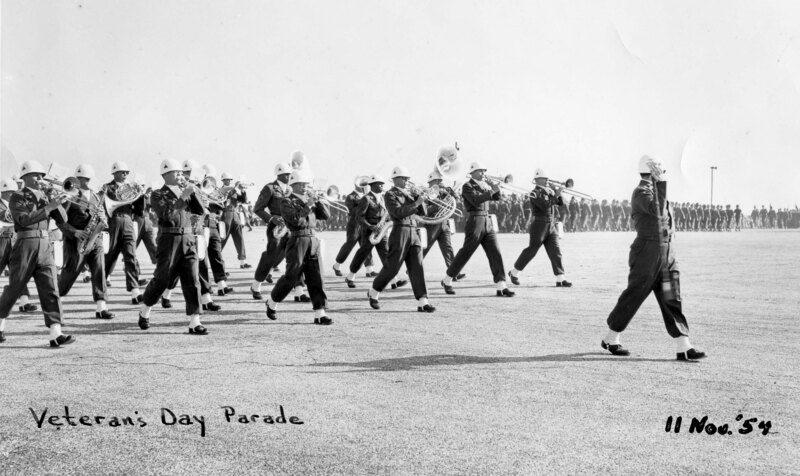 I have a photo of our band marching on Veterans Day, November 11, 1954 (below), and since the trombones are in the first row, I am quite visible (2nd from left). We occasionally met dignitaries at a nearby airport. This type event involved the dignitary reviewing an honor guard, escorted by a host, while the band played. We did some traveling within the state of Texas, e.g., to county fairs. We went to San Antonio several times while I was in the band, and stayed at the historic Fort Sam Houston. The band marched in a 6 x 7 (= 42) formation. Combining playing, watching the drum major (who did not use a whistle) and keeping alignments and spacing was a bit of a challenge. Band members felt a little superior to the other troops in parades, as some of them collapsed from heat exhaustion or just plain exhaustion, while the band never lost anyone. But, of course, we marched frequently and were in good physical shape. The various types of engagements required that we play a variety of kinds of music. Concerts included transcriptions for band of classical music as well as “lighter” popular music. Of course, for parades and concerts, Sousa marches (e.g., Liberty Bell, the U.S. Field Artillery March, Washington Post, King Cotton) were a staple. Since the commanding general was a West Point graduate, the Official West Point March was played frequently. Playing for an occasional memorial service for those whose bodies were returned to the U.S. from Korea was a touching experience. My impression is that very few of the dead were returned, but full military honors were provided for those that were. I can still “hear” a military band playing hymns and also Chopin’s Funeral March. For me, it is an emotional memory. Related, my mother died in September 1954 (I went home on an emergency leave.). Although asked to reenlist, I of course was not interested. However, our group had excellent esprit de corps. We were highly disciplined, partly because of the demands of music performance. It was a maturing experience for me. Upon returning to the University of Nebraska, I rejoined the University Band, and played until completing a master’s degree in 1957. But when I moved to the University of Minnesota to do a PhD (in economics, specialty agricultural economics), my music “career” was over. I ultimately gave my trombone to my God daughter. One postscript: I joined a church choir as a tenor, and although I could read music, my inability to sing as well as I thought I should frustrated me. This entry was posted in Our Alumni. Bookmark the permalink.